Here’s what to do when a check is returned for NSF (Insufficient funds). This is also the procedure for EFT Rejects from online giving. The process for Reversals and Corrections is very similar. The bundle in which the contribution was recorded would most likely be closed. If it is still open, you could delete that item and adjust the bundle total. However, this method is not accurately recording the transaction, so we don’t recommend it. Go to the individual’s people record and select Giving > Statements tab. Click the contribution total beside the appropriate year. This will open Contributions > Search page, filtered for that individuals’ contributions for the selected year. Find the specific contribution in the list and click the Return button under the Actions column on the right of the page. If the check was split into multiple funds, you must click Return beside each line item that has that same check number. Record the results of the returned check in your general ledger. 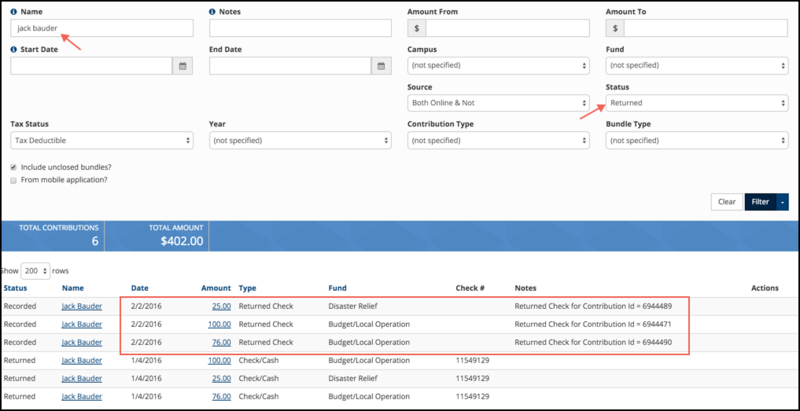 Another way to find the check that has been returned is to go to Administration > Contributions > Search , enter the check # in the Notes field and search. In order for the action butions to display, you must click the name of the person matching the correct check (there may be multiple people with that same check #). Basically, you perform this function on Contributions > Search when you are viewing items for one specific individual. When a check is flagged as ‘Returned’, the original contribution will have a Status of Returned with the Type remaining as Check/Cash or Online. A new contribution record is created that will have a Status of Recorded and the Type will be Returned Check . This record with have in the Notes a message like this: “Returned Check for contribution ID = 1234567” On the Contributions Search page, if you want to view both records, you can select the Status Returned . Notice in the screenshot below, the reference number for the returned check is to the Contribution ID#. The original bundle will now be reduced by the amount of the check as will the total Contributions for the individual and the contribution will show as Returned. The bundle will never need to be re-opened, so it is appropriate that the totals now do not match. Returned checks do not show on a person’s Contribution Statement, nor does the original contribution for which the check was made.